Along the Sussex Coast we are visited by both Harbour (common) and Grey Seals. Often they are seen swimming up rivers. But sometimes they need our help. It is mainly Harbour seals which are seen off our coastline, but we do occasionally get visiting Grey seals from the north French coast. There are colonies of seals off Dover and at Chichester Harbour. Occasionally we find seals sunning themselves on mud flats around Denton Island, Newhaven. Seals are mammals and they will come out of the water and sun bathe, quite often they will lie on their side waving a front flipper in the air. These are normally ok and do not need rescuing. Harbour seals are born during the summer and youngsters can sometimes wash up onto local beaches unable to feed themselves. A normal healthy seal will be nice and rounded, where as a poorly seal will lose weight and have wrinkled skin, a visible neck line and possibly visible pelvis bones. If you need advice on seal on the beach them please contact WRAS on 07815 078 234 or BDMLR on 01825 765 546. WRAS has been called out to several sightings of seals in river across East Sussex, mainly the Ouse and Cuckmere Rivers. Normally they swim up rivers following fish and when there are peak high tides. These seals are usually healthy and can stay around for several days or even a couple of weeks before swimming back down to the sea. Sometimes along the Sussex coast we get Harbour seals resting on concrete breakwaters or wide groynes as well as on the shingle beaches. They will often be on their sides and waving a flipper or "bananaring" which is where they lift their head and tail up curving their bodies, this is normal behaviour. 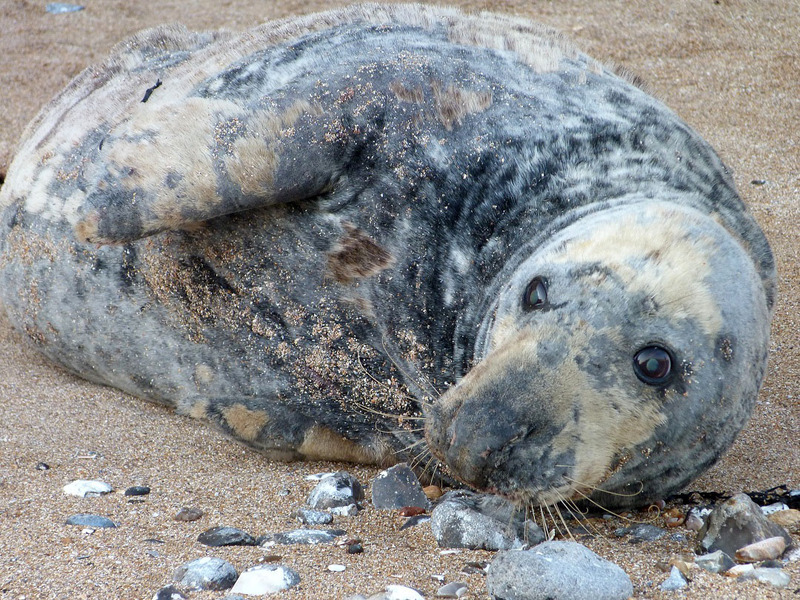 Occasionally we get young common and older grey seals on our beaches which are not very well. Most seals will loose body condition when they are not well and this can be the first sign of a problem. Seals should be nice and rounded from their head to their flippers. If a seal has a visible neck or you can see the bones of its rib cage or pelvis then there is a problem and experts from British Divers Marine Life Rescue (BDMLR) need to be involved. Most of WRAS’s rescuers are trained Marine Mammal Medics with BDMLR and therefore work under their guidelines and instructions. If in any doubt then please call for help and advice.